Jaaxy is the best web-based keyword research tool that offers you the advanced features (alphabet soup technique, website analysis and much more). This tool is easy-to-used and it can help you to find the exact keywords that people around the world searches online. Are you struggling to break down the niches? Limited idea to get access to high-quality keywords? Check this out, see what Jaaxy can do for you. Remember, there are four important metrics in determining the quality of a keyword such as the number of searches per month (at least 100 searches per month), quoted search result (less than 200), quality keyword indicator (green is excellent) and SEO score (higher is better, max. 100 points). You will get all these data through Jaaxy. Let we see what Jaaxy can do here. 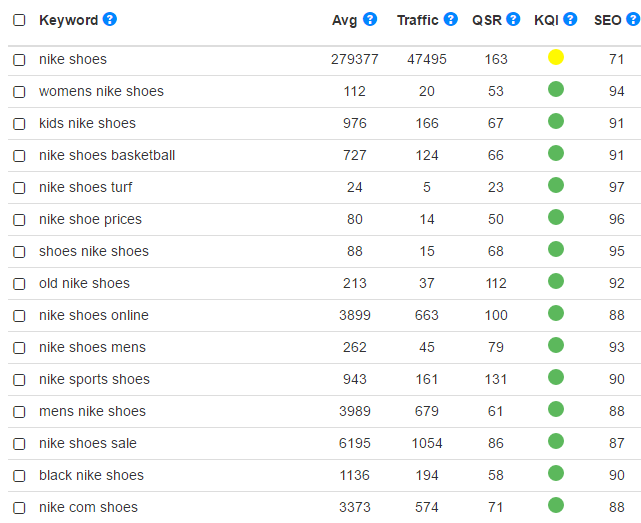 >> Can show the number of searches for each keyword receives per month include with the numbers of Quoted Search Result (QSR). What is QSR? QSR will display the number of competitions for the exact keywords chosen. >> Can show you the exact keywords, niches, and a perfect domain name results in minutes. 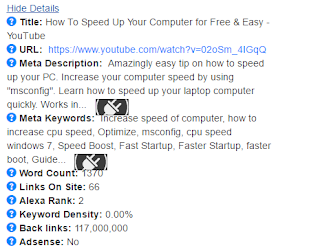 >> Maximizing the keywords search and you will not miss any important keywords. >> Show you the accurate data i.e. traffic, the number of competitors, SEO score and etc. >> Show you a fast visual of KQI. KQI is a keyword quality indicator: Green is excellent, Yellow is OK and Red is bad. 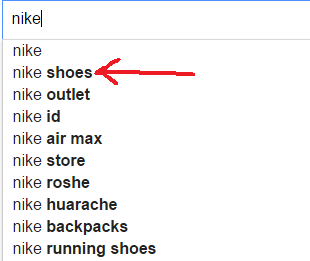 2) Then, I choose ‘Nike shoes’ as a niche. 3) Login to Jaaxy account. 4) Then, click ‘Search’ tab and click ‘keyword’ menu. 6) Tips to get your page going up faster under first page in a search engine: Choose the number of searches at least 100 per month, choose less traffic (low competition) and QSR should be less than 200 or 300. Remember, it still makes sense if you use a keyword that receives 100 searches per month, okay, I will show you. Let's do a math. For example, if your page gets ranked on the first page on search engines and you have 10 keywords (each one of keywords received 100 searches per month), the access for those keywords are 1000 searches. 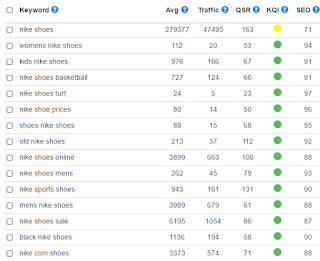 In addition, keywords like 'women Nikes shoes' and 'Nike shoe prices', you can use them in your blog contents to make your page get rank easier in search engines. You must know, the benefit of using long-tailed keyword is, people who are searching for a specific product name or terms are more likely to buy it. >> Everyone wants to optimize their marketing or advertising campaigns but without enough data, he or she will miss the important keywords that cause him/her lose money. Remember, 4 keys metrics that I had mentioned above can save your future campaigns like PPC, video marketing and etc. >> Domain flipping: If you like to earn fast income online with fewer budgets below than $10, you can do this kind of business. So, what you need to do? Of course, you need Jaaxy to help you to find a perfect domain name for your blog and then, you can buy a domain name at Namesilo (Domain price: $8.99 per year and free WHOIS protection for life). Then, publish your website posts. I give you one example how to create a quick website, do you like soccer? How many people pretend to be like Neymar, Messi, Cristiano Ronaldo and so on? What kinds of soccer shoes they wore? How to be like them? How to improve soccer skills? All of these are keywords you can use in your website contents. You can describe about footballer profile, soccer shoes, soccer drills and so on. If you like to talk about striker position, then you should focus on it and do not focus on the other positions to save your time. Then, make it ranking in search engine and sell it. >> No need to spend a lot of time to do research related keywords. >> The opportunity of your pages gets ranked on the first page in the search engines are high. >> Of course, you can beat your competitors. >> Your life becomes much easier. >> Sign up your free account here. >> Pro: Only $19 per month – Unlimited keyword searches. >> Enterprise: $49 per month – Unlimited keyword searches and suitable for serious people. Jaaxy is the most advanced keyword research tool that can bring huge benefits to internet marketers, writers, freelancers and etc. In addition, Jaaxy is a right tool for people who are seriously in the internet marketing. The ability of Jaaxy can do more tasks, easy-to-used and shows a quick result (it only takes a few minutes without interruption) are factors why I choose Jaaxy as the best keyword research tool nowadays.